Please click on the image below to review the display boards from the open house. 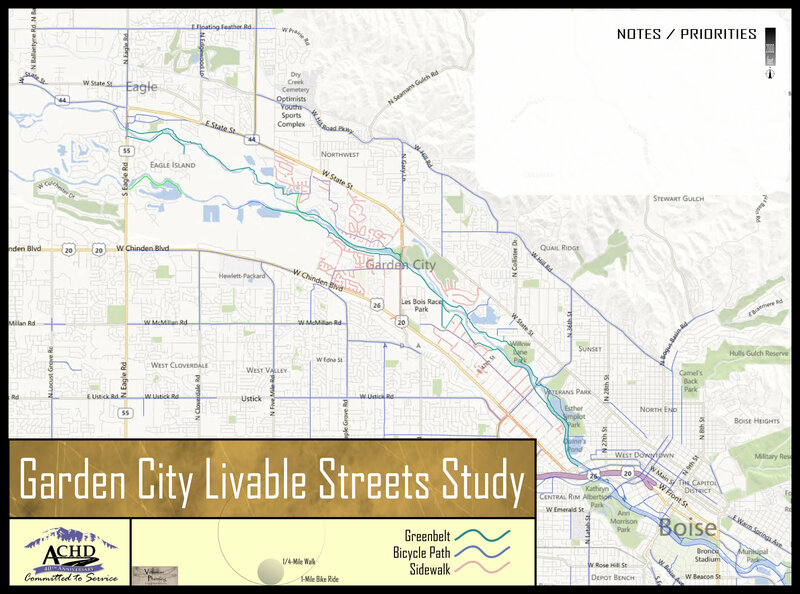 ACHD and Garden City are developing the Garden City Livable Streets Plan to establish a strategy that will guide and coordinate future development and transportation planning. The goal is to create appealing neighborhoods for residents and businesses with streets and facilities that support all modes of transportation (pedestrians, bicyclists, transit and motorists). Determine what the streets within Garden City should look like and where pedestrian and bicyclist improvements are needed. Develop an implementation plan that includes a list of prioritized projects, as well as funding and legal implications. Support the implementation of the goals presented in Garden City's Comprehensive Plan. Coordinate transportation and land use decisions. On Thursday, November 8, 2012, ACHD held a public workshop to gather input on what residents envision for Garden City's future, as well as what they would like their streets to look like. Display: What is a Livable Streets Plan? What will the outcomes be? What's Next?